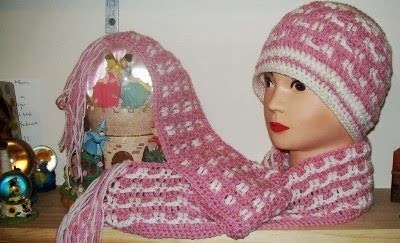 Introduction: Do you love those crocheted garments that are made all in one piece with just a little bit of sewing to finish the garment off? Well this is one of those. Construction details: Begin at the bottom front band, work your way up to the sleeve placements, break off yarn and make a chain, then join to the side of the sweater, work across the chest part of the sweater, make another chain length for the arm, then return working arms in place with the body of the sweater. When you come to the neck and head area, you will replace the st’s with a length of chain for about 4 rows, then continue without the chain lengths working across the sleeve, back and sleeve part. Continue along until the sleeves are finished, then break off yarn and join to the body only and finish the back of the sweater. The side seams are then sewn and the lengths of chain in the neck and head area are gathered and sewn in place, giving this sweater a little bit of extra decoration, or you can even try to hide them completely! The beginning ch2 or ch3 is not counted as a stitch throughout pattern. Gather the length’s of chains from the head space, find the middle of the chains, sew the middle part together, then sew to the outer part of the sweater on the chest area, add a button/ decorative item to hide the chain join on the sweater. 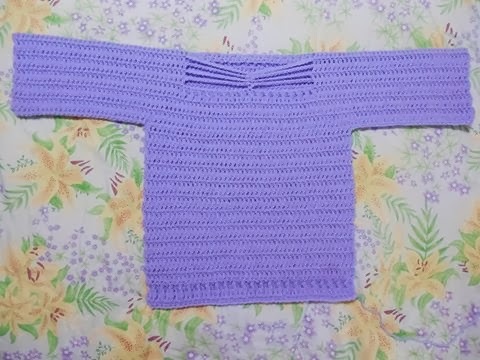 This pretty lilac sweater was made by Deanne Galanty, she chose to gather her chains to resemble a butterfly, well done Deanne!